The Electro-Hydraulic Cadaver Lift by Mortuary Storage Solutions (MSS) is a heavy duty, user friendly, multi-use system designed with the operator in mind. MSS asked many operators in the industry what they would like to see in a cadaver lift. This lift is the design the operators asked for. The cadaver lift features twin hydraulic rams for consistent lifting power. 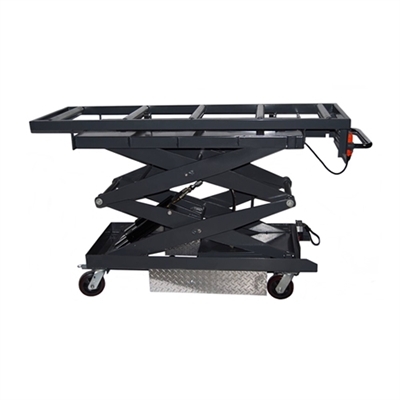 Standard are 6” casters and a 21” wide lift that makes maneuvering even in smaller coolers a breeze. 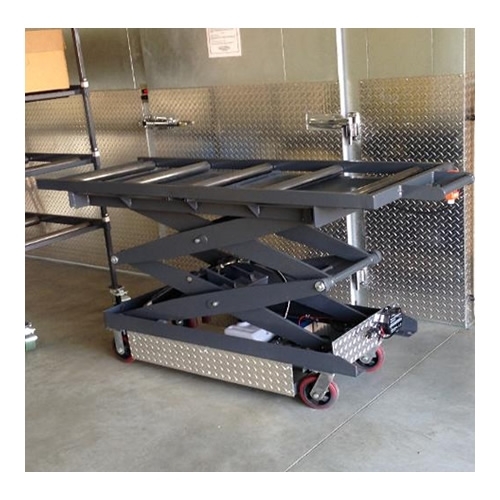 The roller bed employs the use of a linear actuator as a braking system to secure body boards, cremation containers, air trays and caskets. The lift is powered by a sealed 12 volt electrical system, which includes an onboard battery charger/maintainer that uses standard 115 volt household electricity. Also standard is a battery level indicator. The remote control (up and down) is button activated and is mounted up near the chrome push / pull handle for better control. The electrical wiring is ran up to the roller bed as well as the wiring for the linear actuator braking system. The hydraulic pump, battery and electronics are covered and protected by a sheet metal cover. Everything about this lift is heavy duty, yet it is easy to maneuver and operate. Mortuary Storage Solutions' products usually ship in 4 to 6 weeks depending on availability. Please call us before ordering if you need to know a more accurate shipping date for this product. Our website is unable to accurately calculate shipping rates for Mortuary Storage Solutions' products, so the $650.00 per unit shipping rate that appears during the checkout process for this product is only a "worst case scenario" estimate. Upon shipment of this product, your credit card will only be charged the actual shipping rate as provided by MSS. If you need to know the actual shipping rate for this product before placing an order, please call us and we will be happy to get that information for you.